The regal entrance gate 1.05m high. These can be hung as a pair (pictured) or as a single pedestrian gate. They are priced per leaf, therefore if you require a pair please choose a quantity of two. Includes stainless steel bars. 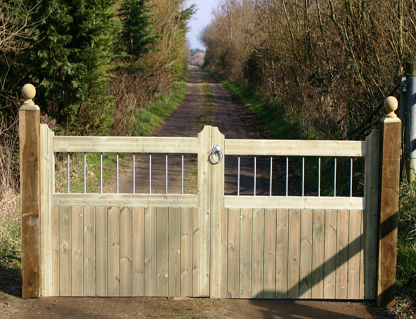 We can make these gates to the exact size you require, this is generally up to 1.8m per leaf in either direction. If you wish for your gates to be a certain size or want to confirm your made to measure price please call your local branch.